If you’re wondering what exactly is Plexiglas, the simple answer is: it’s a great alternative to glass. Plexiglas is a plastic material invented in the last century. It is transparent, shatter-proof, flexible and strong, and used in many sectors, including the one closest to our heart: printing. In this article, we’ll talk about what Plexiglas is and about printing on Plexiglas. 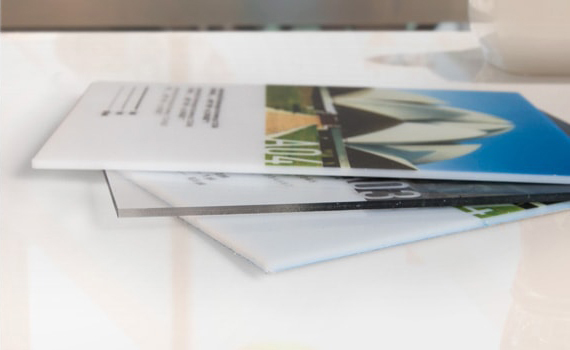 If you’re interested in the other materials that can be used for rigid media printing, check out our articles on Foamex and Dibond aluminium. Plexiglas is a plastic material made from polymers of methyl methacrylate, an ester of methacrylic acid. The technical name for this material is polymethylmethacrylate (or PMMA for short), but it also goes by many other trade names, such as Perspex, Acrylite, Acrylplast, Lymacryl, Lucite Acrivill, Altuglas, Perclax, Oroglas, Trespex and Vitroflex. However, its original and most famous trade name is Plexiglas. As we said, Plexiglas is a great alternative to glass. That’s why it’s also known as acrylic glass and is one of the most widely used plastic materials. Unlike glass though, it is shatter-proof, very flexible and even more transparent (its transmittance factor is 0.93, while that of glass ranges between 0.80 and 0.90). On the other hand, Plexiglas scratches more easily – so it’s not suitable for uses that involve mechanical wear – and attracts dust. It also tends to yellow over time. The qualities of Plexiglas make it suitable for all sorts of uses, from architecture to biomedicine to engineering. But the application we’re most interested in is, of course, printing on Plexiglas. We’ll look at this shortly, but before we do, we’re going to tell you how and where Plexiglas was born. In an article about Plexiglas, it would be remiss not to mention its origins. As with many materials widely used today, Plexiglas was invented in Germany during the last century. Chemist Otto Röhm came up with the idea in 1901 but it took him another 30 years to work out how to market it. It wasn’t until 1933, with the help of colleague Walter Bauer, that Röhm and his firm Röhm & Haas launched Plexiglas on the market. Anyone interested in the history of materials technology should take a look at this page on the invention of Plexiglas. Plexiglas printing can be used to print signs, advertising posters or large and medium-format photos. Suitable for both indoor and outdoor use, it’s also a solution for decorating trade show stands or furnishing apartments. Or even creating a modern design for your event’s information point. Plexiglas plaques are ideal for your office or for museum signage. In addition to strength and flexibility, Plexiglas has two qualities that are perfect for printing: Plexiglas is easy to shape and it is transparent. This means that you can create a Plexiglas sign in a custom shape or backlight a photo printed on opaline Plexiglas. On the Pixartprinting website, you can choose from two options: large format printing on rigid media or printing plaques on Plexiglas. Select the first option for printing Plexiglas signs, advertising panels or photos. In this case, you can choose between two panel thicknesses – 3 mm or 5 mm – and between a transparent panel (which can be used as an alternative to glass) or a backlit opaline one. The maximum surface area is 200 x 300 cm for the custom format, while there are various standard rectangular and square formats. Remember: you can shape your Plexiglas panel! When printing Plexiglas plaques, you can choose between a transparent medium 5 mm thick or backlightable opaline media 3 mm or 5 mm thick. In this case, you can’t choose any shape, but you can pick between one of 14 different shapes and sizes and a customisable rectangular format. As always, we recommend you carefully read the instructions for creating files for printing and choose our Professional File Check service to make sure you send a file that’s suitable for printing. So that’s Plexiglas, and those are the advantages of printing on it. What’s your experience with this type of media?